V3.0 comes with new features! Users can now give consent so you can store their email address on your database! Also they can request their email addresses to be deleted from your database. Export email addresses as CSV files! You now have the option to export the email addresses from the admin area into a CSV file! Price history line charts are a major part of our plugin. Every product page contains graphs of the price variations over time for each of the three price types : Current, Highest, Lowest and Average. Also, you can offer your users the possibility to see the Last 5 price changes. 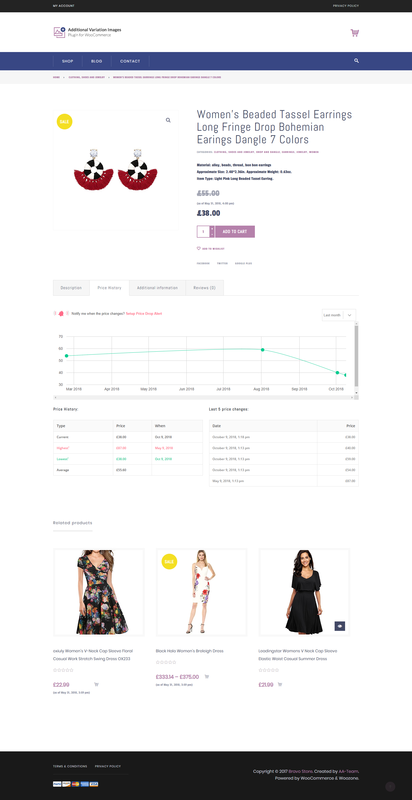 Price and availability data is updated from Woocommerce Products – Product. Depending on the variation of prices, we’ve created a line chart to illustrate the product’s price history, a way of showcasing the price up’s and down’s for your users. Another major part of our plugin are the Price Drop Notifications. If you wish to allow your users to get notified on a certain product that the price has dropped, then you’re in the right place! A cool feature is that you can let your users setup a price drop alert. How does this work? 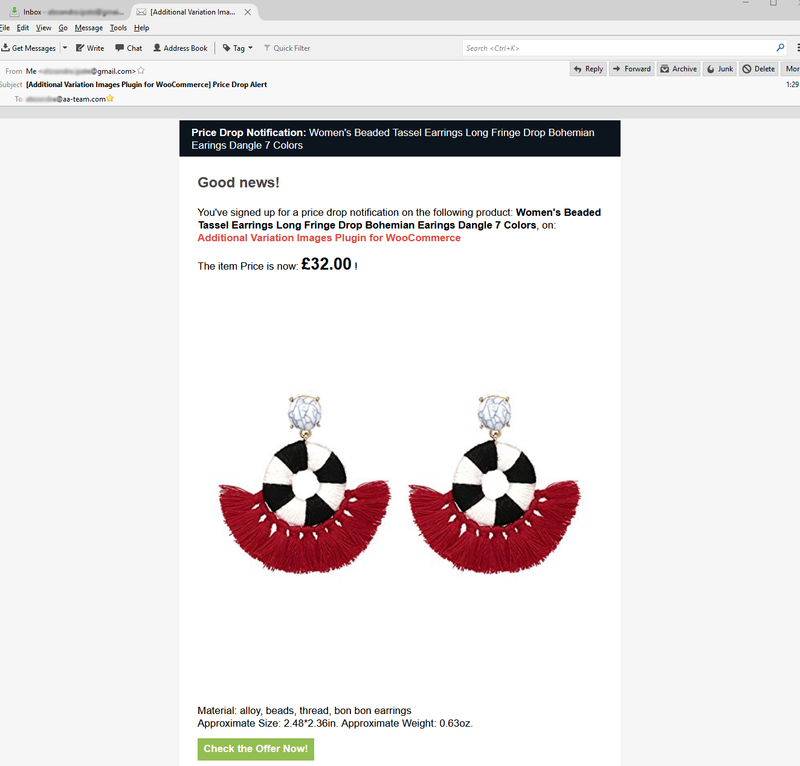 If a user wants to know if a product’s price drops below a certain amount, then all he has to do is to fill out a nice designed pop’up box, with the amount desired and his email address. When the price drops below that amount, the user will be notified via e-mail. This feature allows your customers to wait for a good deal to become available and get notified when it does. 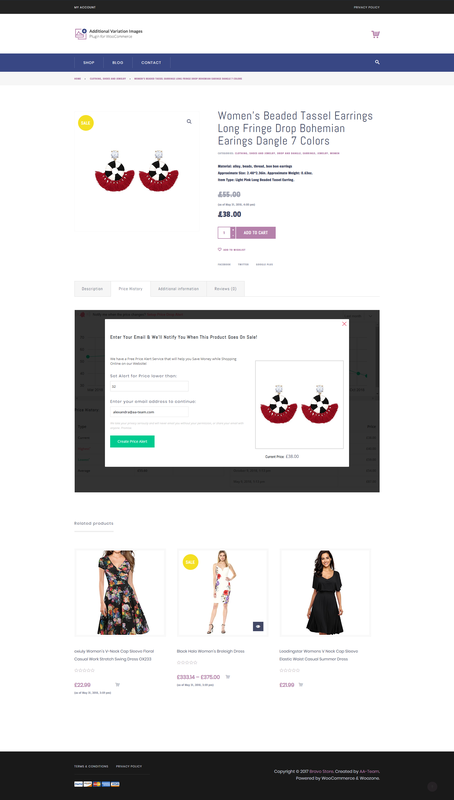 IMPORTANT – the item doesn’t support WooCommerce Variable products.